Steven Spielberg and George Lucas bring you the greatest adventure of all time in an "action-packed family comedy" (Metro) that's packed with "adrenaline surging entertainment" (Daily Star). Indiana Jones and the Kingdom of the Crystal Skull finds Indy (Harrison Ford) trying to outrace a brilliant and beautiful agent (Cate Blanchett) for the mystical, all-powerful crystal skull of Akator. Teaming up with a rebellious young biker (Shia L.. There's nothing more exciting than trying to keep up with the Joneses in Indiana Jones and the Last Crusade. 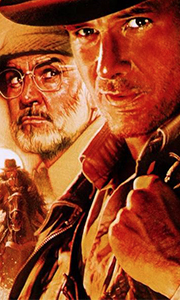 Indy's Nazi enemies are back and have kidnapped his father, Professor Henry Jones Sr. (Sean Connery), to get help in their search for the Holy Grail. Following a trail from America to Venice to the deserts of the Holy Land, it's up to Indy (Harrison Ford) to save his father, save the Grail and save the day in this non-stop, actio..
Indiana Jones and the Temple of Doom brings you non-stop thrills and excitement like nothing you've ever experienced. Indy (Harrison Ford), his sidekick Short Round (Ke Huy Quan), and nightclub singer Willie Scott (Kate Capshaw) go from high-flying action above the Himalayas to a nail-biting runaway mine car chase and finally a spine-tingling escape from a fortress-like mine in India. Hang on tight as the world's ultimate action hero ta..
From the award-winning duo of Steven Spielberg and George Lucas, experience every heart-pounding thrill like never before with Indiana Jones: The Complete Adventures on Blu-ray! For the first time ever, all four unforgettable films are offered together on Blu-ray, featuring brilliant high definition picture quality and 5.1 audio presentation. This five-disc collection boasts fully colour-corrected digital master versions of The Temple O..
From George Lucas comes an all-new, must-see 12-disc DVD collection, The Adventures Of Young Indiana Jones. This first volume of a three-volume series contains more than 20 hours of interactive entertainment that combine real-world history with the boyhood adventure of one of cinema's greatest heroes: Indiana Jones. Join the amazing journeys of young Indy as he crosses paths with Picasso, Freud, Edison and other larger-than-life luminar..
From the creative mind of George Lucas comes a must-own, action-packed, 9-disc DVD collection, The Adventures of Young Indiana Jones: Volume 2, The War Years. This second set in a three-volume series includes more than 13 hours of special features that explore the history behind the adventures of one of cinema's greatest heroes: Indiana Jones. Go on spectacular journeys with young Indy as he travels through Europe, Africa, and Asia an..
From legendary filmmaker George Lucas comes an exciting, new, not to be missed 10 disc DVD collection, The Adventures Of Young Indiana Jones: Volume Three, The years of Change. This final volume completes the series and delivers more than 15 hours of special features that explore the fascinating history that inspired the daring adventures of a young Indiana Jones. Follow the thrilling escapades as World War I ends and young Indy gets en..
Steven Spielberg and George Lucas bring you the greatest adventure of all time in an 'action-packed family comedy' (Metro) that's packed with 'adrenaline surging entertainment' (Daily Star). Indiana Jones and the Kingdom of the Crystal Skull finds Indy (Harrison Ford) trying to outrace a brilliant and beautiful agent (Cate Blanchett) for the mystical, all-powerful crystal skull of Akator. Teaming up with a rebellious young biker (Shia L..
Own Indiana Jones - And The Last Crusade DVD from Deff, DVD, Blu-Ray & 4K Video Specialists - Free UK Delivery..
Own Indiana Jones - And The Raiders Of The Lost Ark DVD from Deff, DVD, Blu-Ray & 4K Video Specialists - Free UK Delivery..
Own Indiana Jones - The Complete Adventures (4 Films) DVD from Deff, DVD, Blu-Ray & 4K Video Specialists - Free UK Delivery..